Many things take place in these moments we call time. It is now in this moment I share one of them with you. Refinishing a set of six Burke tulip chairs and three Kinetic K700 stools. But wait. There's more. We have new neighbors. Two hipster brothers procured a great little Mid Century Modern home in our hood. They plan to restore, having already found original flooring in great condition beneath tired carpet. Greeted them with a house warming gift in the form of Atomic Ranch magazine's latest issue. Turns out I know one of the brothers. Paths have crossed several times over the years. Now we're neighbors. Fitting. He's employed at local Indianapolis contemporary furniture store, Houseworks. Not a bad neighbor to have. Just saying. Long-time readers may recall this image and laments regarding overgrowth hiding architecturally interesting features. First action by the brothers was to remove the infraction, revealing 12 cubes cut into off-center privacy wall. This wall shields outdoor patio. Addition of the brothers brings our neighborhood's cool renovator count to six. Six Mid Century Modern enthusiasts on a mission to beautify and bring attention to Indianapolis' little-known MCM oasis called Devington. Detour taken to share latest additions to our growing family. Good friend, and inspirational sounding board donated his Herman Miller Aluminum Group coffee table to our evolving abode, citing "there just wasn't room for it anymore". Have yet to experience this problem of which he speaks. Grateful indeed. Latest Goodwill excursion netted sweet set of vintage Panasonic speakers. They sound good but it's the detail in the grill that pulled me in. Model (SB-3057) search on Google did not return any substance. Craigslist delivered huge prize. Been on hunt for patio heat source. Ebay typically starts bidding at $500 for like items. We walked for $75. Can't wait to fire it up and invite new neighbors. Full-circle brings us to main event. Chair refinishing. Purchased set of six Burke tulip chairs at 20th Century Cincinnati as chronicled here. Image above does not reveal chipping bases and slowly yellowing original gel coating. Many moons ago, scored set of three yellow Kinetic K700 stools. As Atomic Indy kitchen panel voters know, yellow stools do not work with newly painted island. Friend is a fabricator for ACS Sign Systems in Indianapolis. ACS often works with architects, which automatically adds to their cool factor. Rolled in on quiet Saturday morning. Prepped chairs. 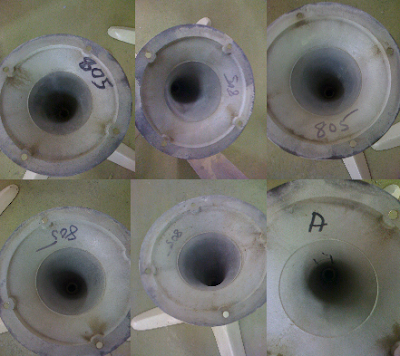 Base removal revealed "805" written in five of six, with six labeled "A". Any known significance to this? Thoroughly cleaned, sanded, reassembled. Filled nicks or inconsistencies with acrylic epoxy. Sanded again. Image resembles chair police line-up. Friend in action hitting chairs with architectural grade semi-gloss white from Matthews Paint. Notice color variation on chairs to his right. Chair band reunited atop newly acquired cowhide rug. Cushion fabrication in process. Still sitting around plastic folding table awaiting great deal on oval tulip table. Plans to paint this wall in very near future. K700 stools playing well with orange island. Love when a plan comes together. Had first bout of yard work last weekend. Lost. Delicately type through a case of poison ivy. On the happier side, shaped bushes for first time and didn't create any bald spots. Off to scratch this itch. I thoroughly enjoy reading your blog, especially posts like this - it's great to see your chairs coming back to life! I also love seeing the progress in your neighborhood, I need to make it a point to do a small driving tour next time I'm down in Indy. I would have loved to have bought a little MCM gem for myself back when I was house-hunting, but alas, Lafayette had a lack of MCM homes within my price range at that time. So I decided on a lovely little Craftsman built in the 20s, which is definitely being retouched with some lovely MCM details. I will live vicariously through your blog for now, the results of your hunting trips are always fun to see! You are doing a great job with your place, I bet you're having fun too! I like the way you carefully plan everything and dont just opt for cheap/fast like many do. that fireplace will rust outside! next time you're in Indy let me know and I'll direct your driving tour with pleasure. We are having a blast. A lot of work but always fun. Decisions are made carefully but it still doesn't eliminate the occasional "if I could do it again" thought. Thanks. Thought of this. It's spent that past couple years of its life outside. Rust is mostly holding off. A few spots to contend with. Will steel wool, de-rust, and re-coat with hi-temp paint. Can you please tell me how to sand the tulip chair and the type of paint that I need. For paint, we used architectural grade semi-gloss white from Matthews Paint. How much was it to have the cushions on your Burke chairs redone? Where did you have it done? What fabric did you choose? We haven't made new cushions yet. The ones you see are what were on the chairs when we bought them. Not original. As for fabric, the sky is the limit. Knoll, Eames, Generic, all depends how much want to spend. I'm about to pick up a Burke table and chairs set off CL but it's missing the bolts. Do you know what size or if they are readily available at hardware stores? Also, this one has fabric on the entire seat instead of just the cushion. I've been googling to see how easily I could remove and refinish under the fabric, but I haven't seen another set with the fabric backing. Thank you so much! Your blog is so awesome. Based on the Eames shells, upholstery removal is fairly straight forward. If there's any glue, alcohol should do the trick. If not, Citristrip or mineral spirits should knock it right off. As for bolts, they should be standard sizes.